In the fall of 1991, I was hiking in a remote area of British Columbia called Bute Inlet. It was there that I happened to pick up the small, curiously marked (to my eye) stone that triggered my attempt to document what I have termed “anametric Image writing.” I plucked this incongruous artifact from the gravel of a logging road that served the small lumbering operation in the inlet. This road was a purely local concern, as there is no way in or out of Bute inlet other then by small bush plane (which is how I arrived there), marine transport — or an arduous and extended overland expedition through some of the most demanding conditions and treacherous territory on the NorthWest Coast. With but a very few and singularly notable exceptions, all of the thousands of stones I have examined for traces of anametric image writing, and the many hundreds of definite examples I have found, have come from similarly disassociated situations. While this approach has yielded examples which are devoid of any archaeological context, this is also an approach which has left any sites of potential archaeological interest entirely undisturbed. I can see virtually no reason to disturb any locations in researching anametric image writing: there is no shortage of examples to be found below the high tide mark along beaches, on gravel roads, in ornamental gravel beds used for landscaping, and other readily accessible, entirely disrupted and disassociated sites. If you choose to investigate anametric image writing yourself, please respect the integrity of undisturbed locations. Under no circumstances should any sites of past First Nations occupancy be disturbed — and there is no reason to do so! Examples of anametric image writing abound, and can be found almost anywhere. Consider: if paper did not disintegrate over time, we would currently be up to our necks in examples of writing from the last 200 or so years. 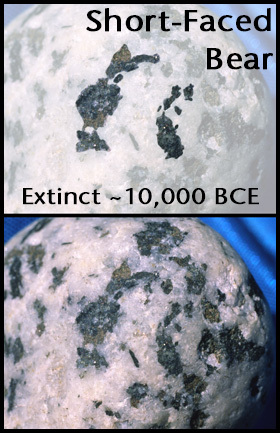 Rocks do not easily wear away; so, how many examples of anametric image writing do you think there are, everywhere, after at least 10,000 years of constant use? Archaeology and anthropology are not interests of mine. My academic background, dating back to the early 1980s, is in post-structural philosophy. My technical background is in photography, dating back to the early 1970s. My personal focus on writing stretches back to my early education, in the late 1960s; and my involvement with First Nations issues is grounded in my employment history with First Nations' publications; as a reporter, photographer, and darkroom technician. Please consider my efforts here to be the work of a relentlessly determined philosopher who is adamantly committed toward doing everything possible to right a very grievous historical wrong. It has been widely accepted for some time that writing evolved in the Middle East. The standard, widely repeated story is that clay tokens were used in Mesopotamia from around 8,000–7,500 BCE onward to record quantities of agricultural commodities being traded; and, this is certainly true. Pictorial representations of these agricultural commodities were incised upon the clay tokens, and were used to indicate the number of each such item being transported in trade. Of that, there is no doubt. Increased volumes of trade led to these tokens being placed in sealed clay containers called bullae during transport, with indications of the contents in terms of tokens being inscribed upon the outer surfaces. That definitely happened. 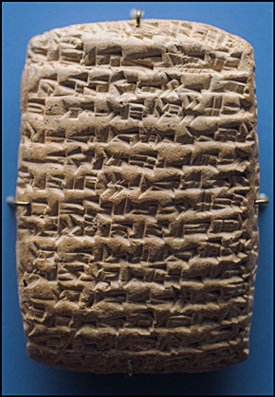 By about 3,500–3,000 BCE, this practice had evolved into one of inscribing pictograms onto clay tablets using cuneiform; and this is generally considered to be foremost among the first forms of writing. There is clear and copious evidence of this. This standard description of a developmental progression for writing’s origin seems simple enough: it is quite straightforward, and is extensively documented by artifacts. All the evidence for that narrative seems to support its exclusivity — until a viable alternative emerges. But when one begins to consider other possible origins for writing, cracks in the logic of the standard model begin to show. Challenged by a competing paradigm, the dominant story line quickly exhibits breaks in its logic, and the actuality of writing's true origin comes into question. -> One major contradiction within this standard narrative-of-origin comes from the proposition that writing arises after the development of agriculture — that is, after human populations become settled. However, writing is at the same time presented as emerging from a mechanism which facilitates trade — which is to say, writing develops within the context of mobile populations. Writing as a function emerges to serve a specific, mobile segment of an otherwise settled population. This being the case, shouldn't a demand for the utility of writing have emerged during the tens of thousands of years of nomadic existence that preceded settled agricultural communities? -> There is another major issue attending the idea that writing arose from economic activity: there is, quite simply, no way to get from what is essentially a system of accounting, to, a systemization of narrative strategies. Keeping count of things does not produce grammatological structure: it produces inventories of amounts, not textures of experience. How does a system that is designed to prevent unauthorized changes in inventories of stock, become a way for sharing the constant changes that experience brings? Any accounting system will function primarily as a way of recording amounts of things. This is to say, numerical values are given primary importance, and in this way serve to contextualize the kinds of things that are being recorded. Such an approach does not allow for the histories of things to be expressed — that which determines what each kind of thing actually is, by way of its real world interactions. Accounting preferences a very specific, very static kind of temporal dynamic; and this is wholly alien to the dynamics of change which inform true narrative structure. So, doesn't it make sense that writing would be more likely to evolve in situations of nomadic flux, where everything is constantly changing? Of course, the standard explanation of writing’s origin would have writing eventually evolve as a way for inscribing the spoken word; and this is where writing finally acquires a grammatological structure — from the spoken languages it represents. Looking back toward writing’s origin from within the context of phonetic systems of inscription, it is difficult to see any alternative to this. However, there are also many graphemic systems of writing; and these do not necessarily fit so easily within this standard narrative of writing’s origin. Indeed, one such graphemic system of writing — undocumented until now, due to phonetic writing’s inability to realize the otherness of its graphemic nature — calls the Standard Model of writing's origin entirely into question. The Standard Model places writing’s origin in the establishment of agricultural production, and with the need for an accurate system of accounting that arose from the long distances travelled in trading agricultural surpluses. However, both “production” as such, and long distance travel, trace back far before agriculture was first established. Both the production of stone tools, and nomadic travels in search of food, date back to well before humans had evolved into our modern form. Why, then, must we assume that writing arose so late in human history, when the conditions from which it seems to emerge appeared so long before agriculture? The point-of-origin for anametric image writing is a surprising one: paleolithic North America. But as strange as this source for writing may sound, I have been able to conclusively trace the evolution of anametric image writing through several major stages of its historical development. It seems certain that anametric image writing is the ultimate wellspring which underlies the glyphic writing systems of Asia, and of Central America. Admittedly, given the extreme age of anametric image writing, it may yet be shown that its nascent point of origin lies in paleolithic Asia, prior to the arrival of humans in North America. Ultimately, this will depend upon when people actually first arrived in North America — and this is a matter that has yet to be settled in all certainty. One thing that is certain, though: anametric image writing had emerged as fully formed and widely used in North America by at least 10,000 years BCE. *Website Original Content Copyright 2017 by John Barclay-Morton; all rights reserved.